Assam has been fortunate in giving birth to a great musical genius in Dr. Bhupen Hazarika. He was an ardent supporter of Assamese nationalism and wrote many stirring compositions about the cultural heritage of his native State, but his work transcended regional boundaries and the values he espoused were universal. Now that mighty voice has fallen silent. Assam is poorer for it. The world is poorer for it. The entire post - colonial period of the one entire Assam, from pre-independent India till today where Assam has been divided into major North - Eastern states, no individual has matched Dr. Bhupen Hazarika's contribution which has motivated, represented, dominated, progressed, enlightened and awoken all the people of this region. This is what shaped Dr. Bhupen Hazarika who through his vision encompasses the entire world, reflects the mood and passion of oppressed and downtrodden of the entire humanity : through ballad through folk tunes he picked up from different soils he came across in his life journey. He has contributed to the socio-cultural political progress of the entire North - East and eastern India and has therefore been rightly as the Uncrowned King of the lands from Bengal, Bangladesh and entire North - East. A portrait of Dr. Bhupen Hazarika was unveiled at the Nehru Centre, Mayfair in London on 26 June, 2012 by HE Dr.Jaimini Bhagwati, who was the First Assamese High Commissioner to join Indian Embassy in London with Gowri Shankar, Deputy Director, The Nehru Centre, cultural wing of Indian High Commission. The dignitaries present were Dr. M. Sayeedur Rahman Khan, High Commissioner of Bangladesh, Lord Swraj Paul, prominent industrialist. Prabin Hazarika (Bhupen Hazarka's brother) with his wife Trisha Hazarika from Leicester were also present. This event was initiated by Rini Kakati, FASS, Assam Co-ordinator for UK. It has been 6 years now till today. Visitors from North - East India, Kolkata, Mumbai and Bangladesh visits Nehru Centre, the heritage cultural building, Govt. 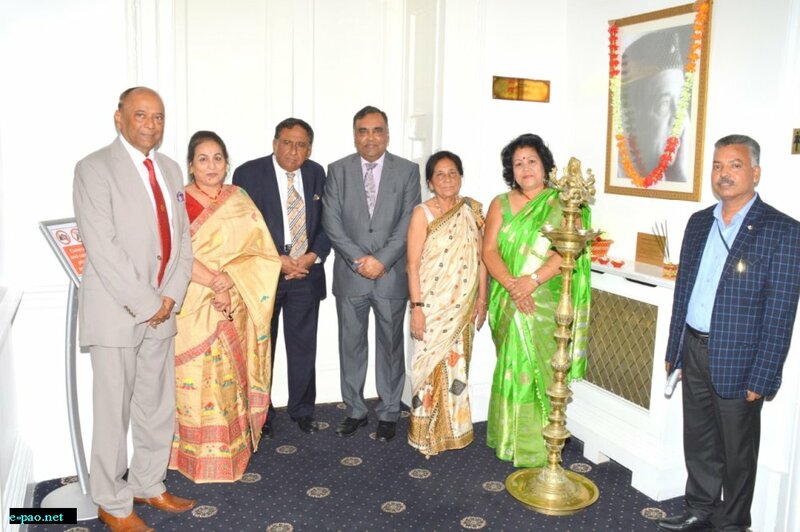 of India at London to pay their tribute to the portrait of Dr. Bhupen Hazarika. It is now a part of tourist attraction. HE Shri YK Sinha Indian High Commissioner to UK on his closing speech thanked Rini Kakati and Deputy Director of Nehru Centre for this great initiative shown to our beloved Bhupen da.